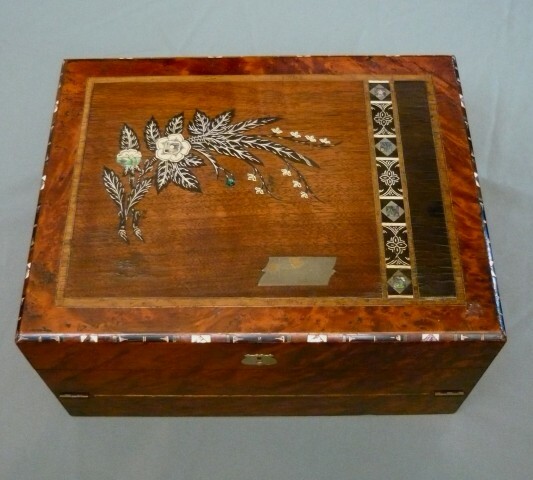 Inlaid writing slope | Jenkinson Antiques - an ever changing cabinet of curiosities! The top of the box consists of a central panel of a dark walnut-like (pukatea?) timber which has been inlaid with ebony leaves that have been scratch carved and inlaid with white enamel. 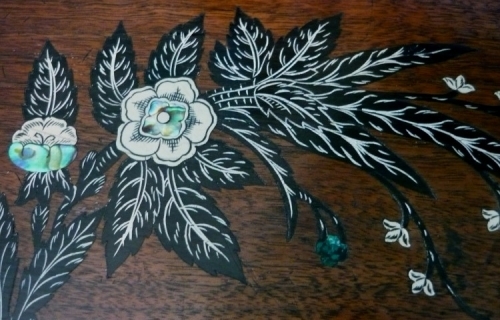 There are ivory flowers that are ink decorated in black and inlaid with pauri shell. There are also 9 flower buds in ivory and one flower bud in New Zealand jade. This panel is flanked by a rectangular pattern on the right hand side that features more inlaid ebony and ivory together with square sections of pauri shell surrounded by silver triangles. This arrangement is separated from other elements by a double silver inlaid banding of contrasting timber, approximately 4mm wide. The lid also contains a silvered brass presentation plaque (that remains un-engraved). The central panel is surrounded by a densely birds-eyed veneer (totara?). The chamfered edge to the top contains ebony, ivory, silver and totara to make up an exotic edge band. 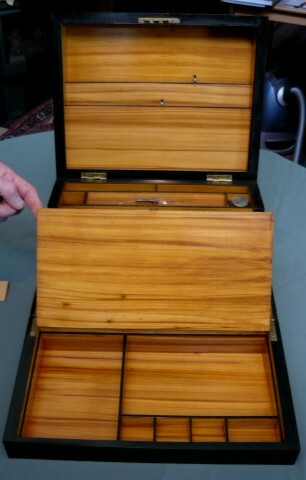 The rest of the box is externally veneered in totara and the upper lid has a silver cartouche escutcheon. 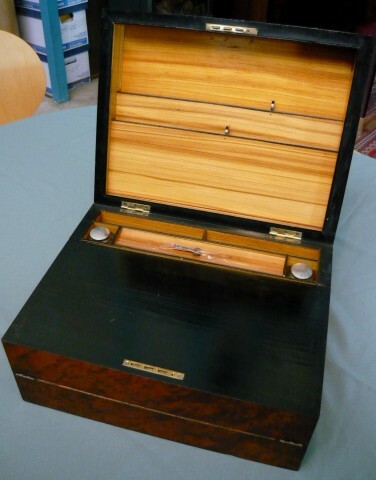 The lid opens to display a letter rack, two ink bottles and a pen slope. The interior is veneered with ebony and the inserted three-tongue mortise lock is original. 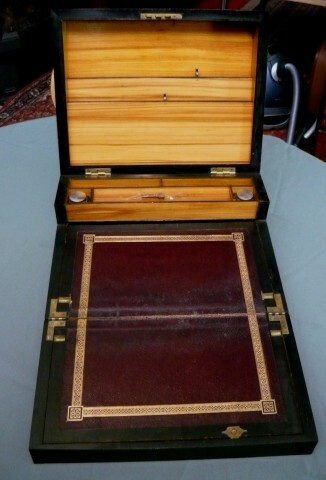 The second part of the box folds down to produce a writing slope that still contains the original gilt red Moroccan leather. The hinging and catches are all original and the original key to the box is present. The internal pine case work has all been polished to a bamboo like colour scheme which contrasts nicely with the black of the ebony. The moving parts all conform and fit together well. The underside of the box still has most of the original black paper. The finish on the box is original and apart from a few cracks to the veneered centre panel, the condition could be described as excellent.